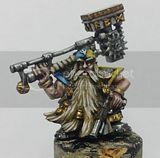 Sons of Taurus: Another campaign: Avast ye Mon-Keigh! While I've been playing in a map-based campaign at the Winston-Salem Games Workshop store using my Endless Ones Chaos Marines, another map-based campaign is getting underway at another local store, Gaming Underground! 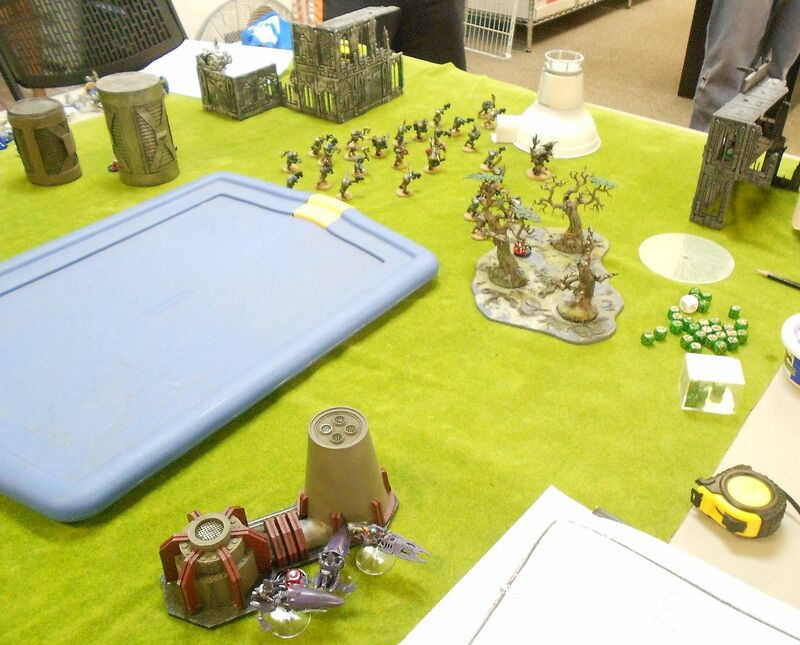 For this one I'm bringing my Void Phantoms, Eldar Corsairs using Eldar with DE allies at higher points. 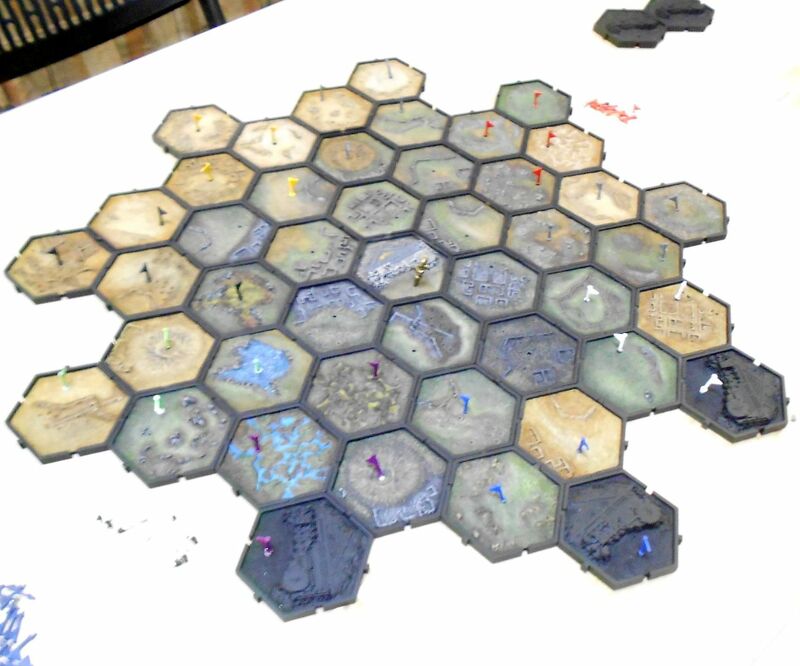 On this map we see the early moves, with my flags in purple at the bottom. One of the store owners, Vinnie, did a wonderful job on the tiles he painted for this. He's also got some Tyranids stomping about on it, will be good to see them back on the table from time to time. The setup is very similar, with free 200pts for your HQ, plus X points for the rest of the army, starting at 500 for round one. For my first battle, I challenged the Orks to my left for the big lake, mostly to see the new book in action. 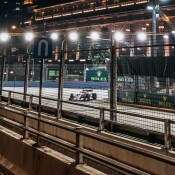 Poor shot from the start. Dire Avengers on one objective, bikers ready to head out to others. Big blue in the middle is water, which we both felt was appropriate given the map tile was a giant lake. The campaign uses multiple missions that you play at the same time, one primary, one secondary, with "secondary" objectives like First Blood tertiary. Our primary mission had six numbered objectives, and each player turn you roll to see which two count as scoring that turn. 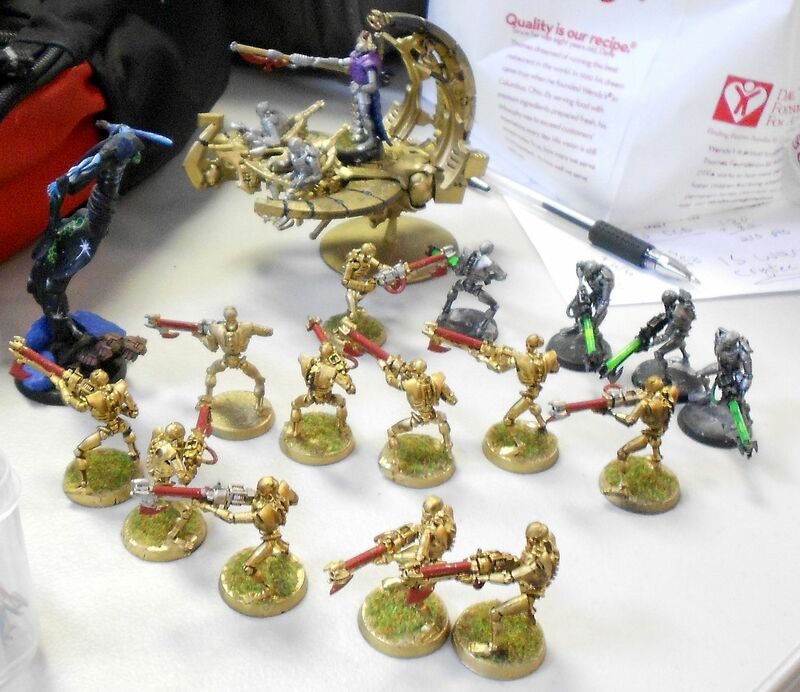 Secondary old-school victory points (destroying 200pt unit worth 200pts, etc). As fragile, fast eldar my main goal is to focus on the primary and try to avoid getting into a true head to head fight with the orks. Rangers take aim at approaching horde of boys and bubble chukkas. 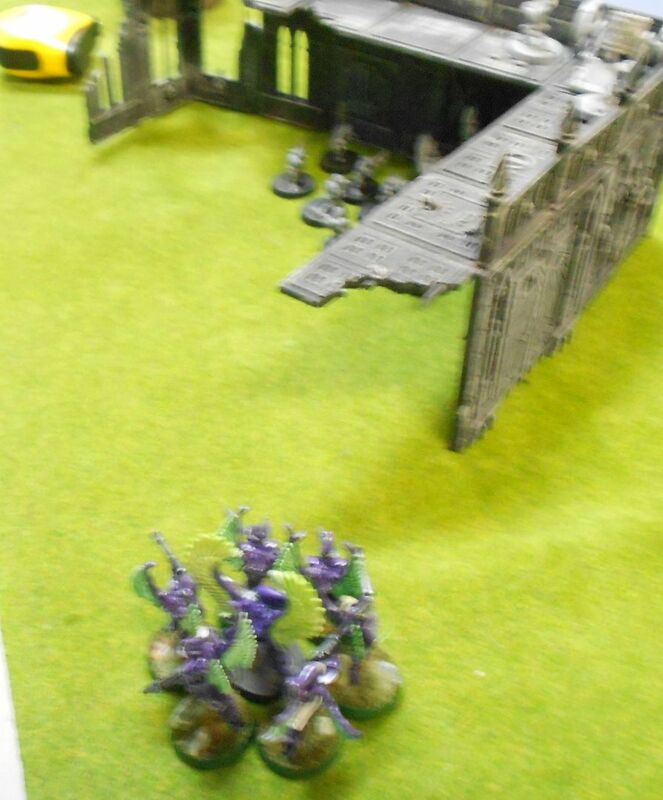 Eldar bikers zip forward, and singing spear lashes out immobilizing the deff dread. Dread twists and big shoota takes out one biker, spooking the rest...a little. They fall back four inches and soon rally. Swooping Hawks and not-Baharroth land and shoot up grots on an objective. 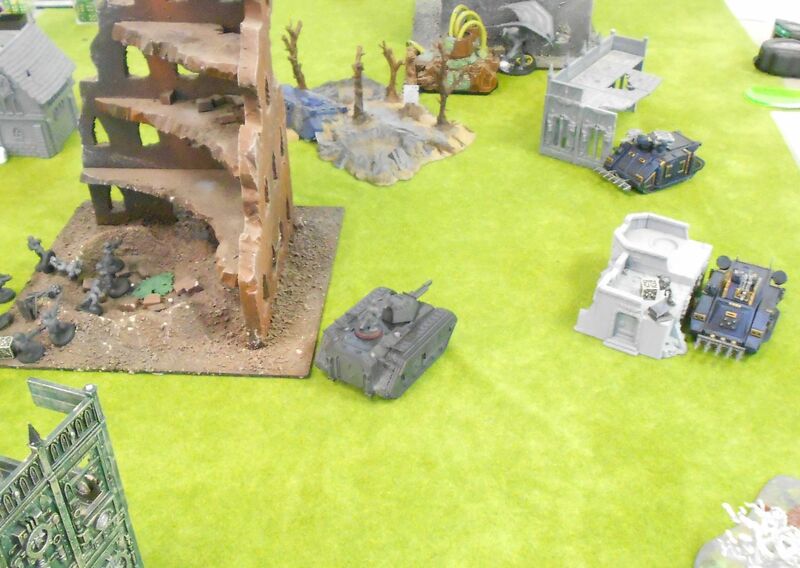 Unfortunately the bubble chukkas had already run off the Dire Avengers, so the orks got full first blood. Baharoths's shooting kills a grot and makes the bubble chukka fall back, the hawks charge and wipe it out. Bikers take another hull point off of the dread. 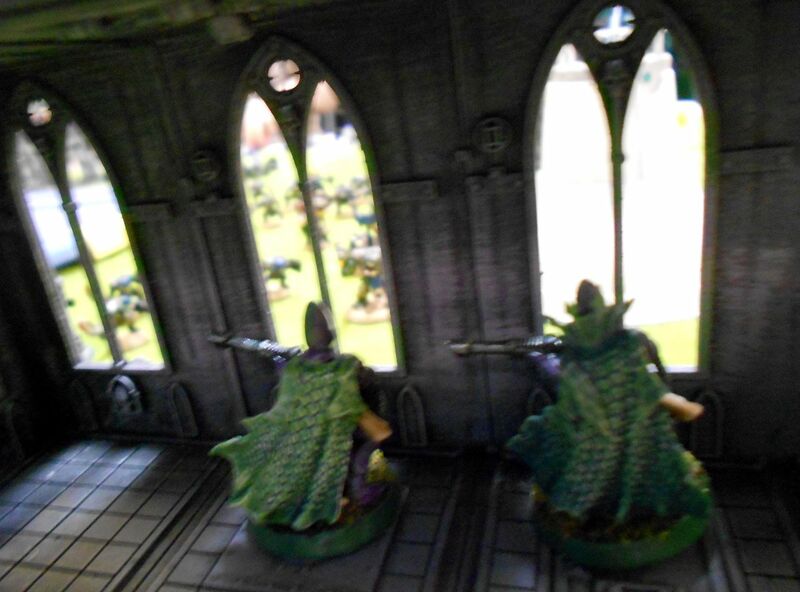 Scorpions arrive, apparently not wanting to tangle with the big ork mob on the other side. Bikers had hopped back to score a few points from objective #1. Hawks skyleaped off board and then back down to cover an objective. 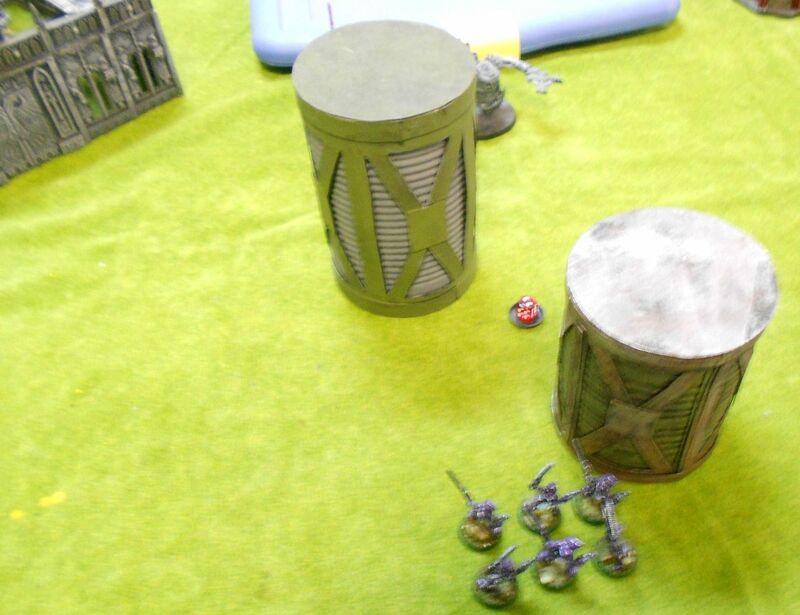 Bubble chukkas had been pounding the rangers as the horde of orks got closer. Firing through the windows, Baharoth's S5 hawk's talon blaster takes out the dread. Surviving rangers picking off greenskins. In the end the eldar won the day. The mobility of the jetbikes and hawks let me respond better to the random objectives, and overall the random rolls for that favored me. As for victory points, I squeaked that out, 195 to 190. He got full points for first blood, I got full points for linebreaker, and neither of us got anything for slay the warlord. 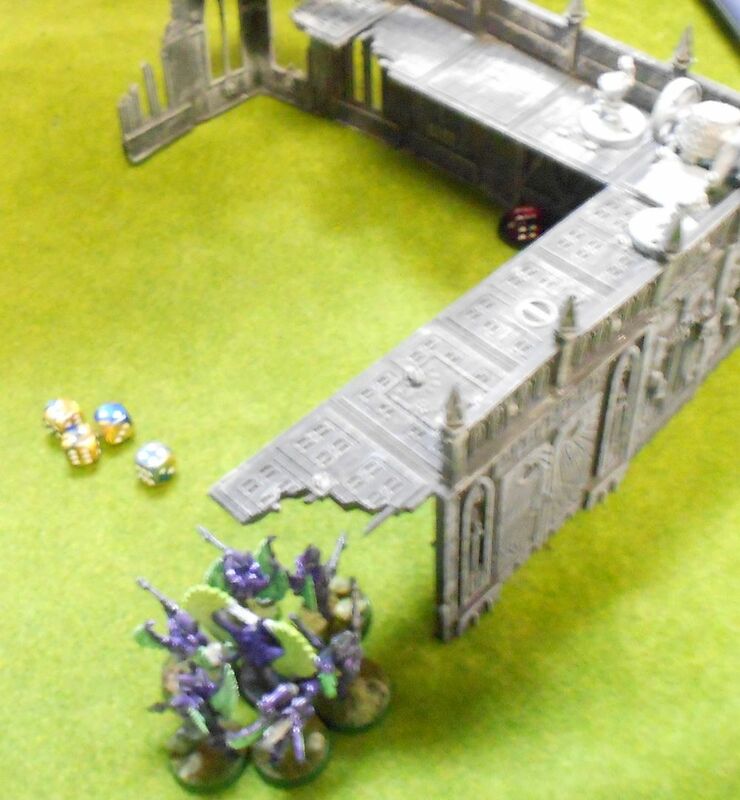 First game as the new eldar, and it went pretty well. Forgot a few rules during the game, but didn't make that much difference. 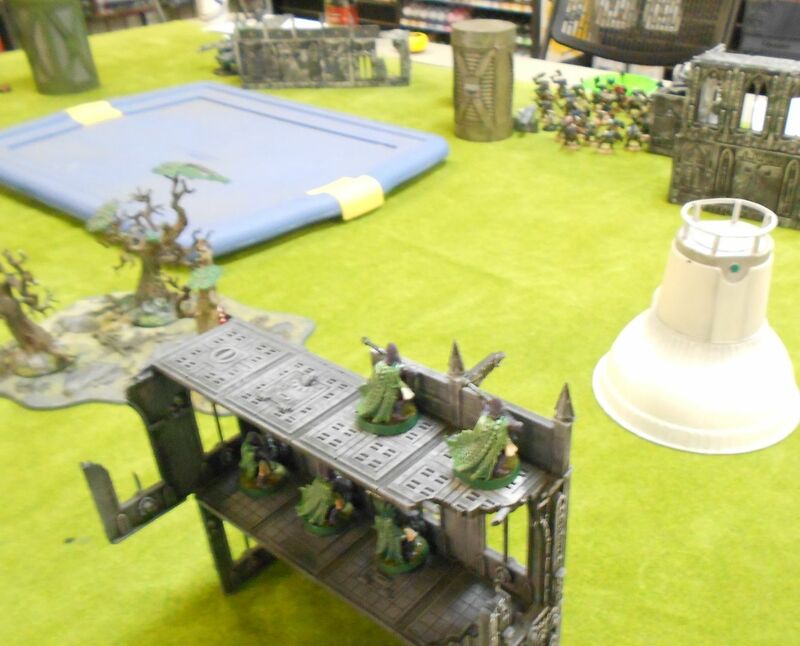 The new ork mob table wasn't that bad this game, only costing him a few extra boys. 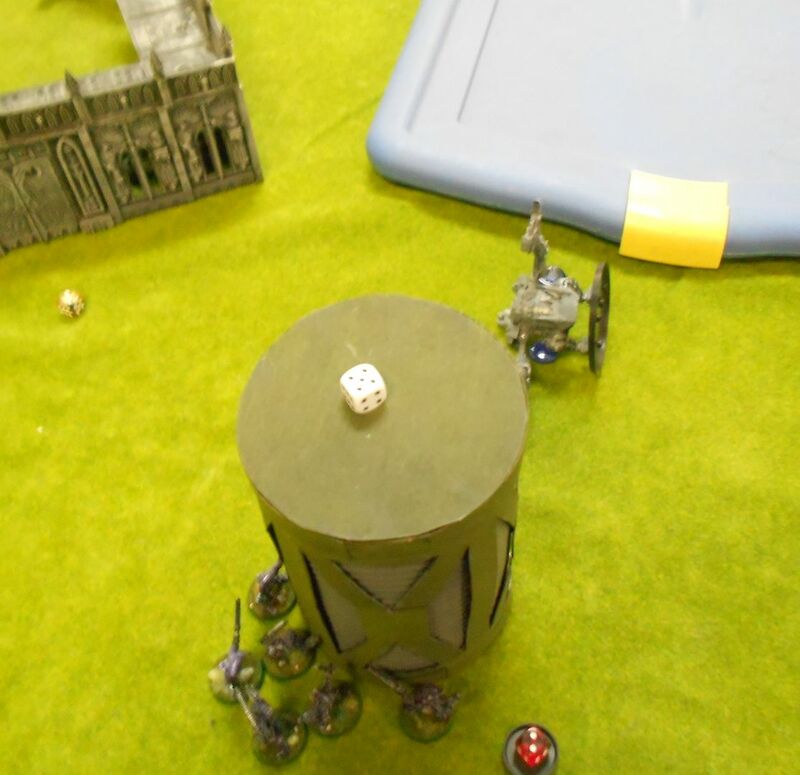 Best moment of the match for me was the rangers getting two precision shots on a bubble chukka, picking off the grot crew. Patrick's necrons. Some nasty dudes and some warriors to fill in points. 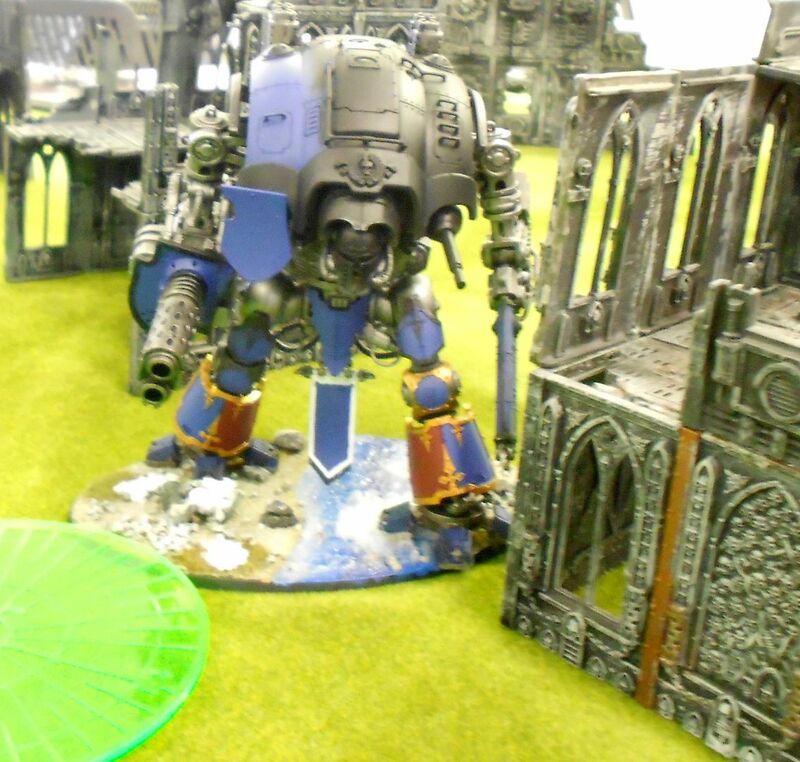 His lord, aside from normal necron resilience, has some extra warlord traits that give him feel no pain and it will not die. Yikes. 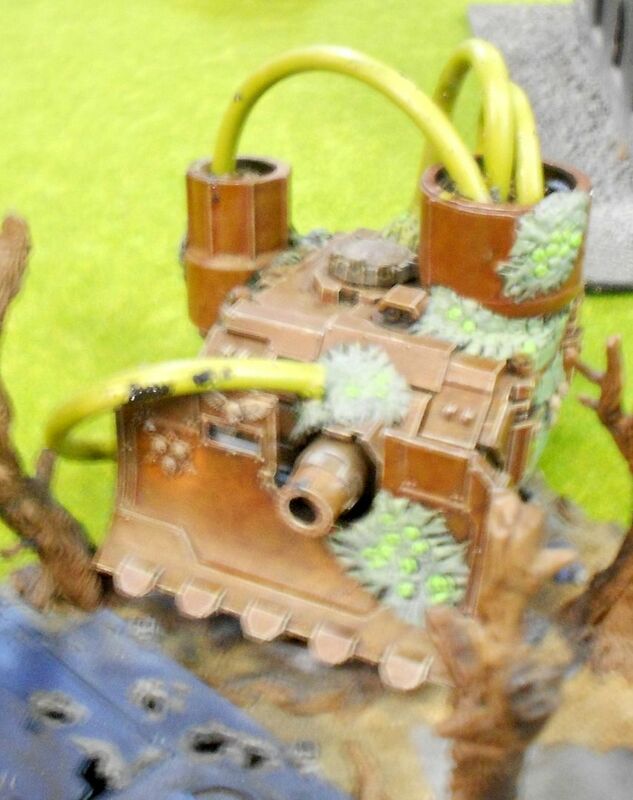 McCoy's nurgle vindicator, the evil super-soaker of doom. Our first knight! He said he used it so it would be a fast game. Yeah, I guess one way or another it would be! In the end it was taken out by a Clan Raaukan biker character with a power fist to the reactor jibblies as it was Stomping him to paste. If I have to fight that thing I hope I can get lucky with some haywire grenades! lol, I got a good chuckle from this post's title! Pow! Right in the knight jibblies. One of the problems with being tall and anthropomorphic.